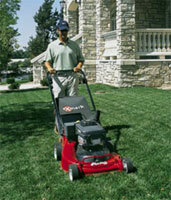 Let our professional crews cut and trim your lawn on a weekly basis and you will be the envy of your neighborhood. We at PJC use only state of the art equipment which allows us to provide you with a professional and efficient service each visit. Fall clean-up is included with this program. Order Your Free Estimate Now!! Let Our professional crews handle the dirty work while you sit back and relax. We at PJC use only the best in state of the art equipment to blow and vacuum your leaves, and debris away to give your property that crisp clean look. When you order the spring clean-up, dethatching is free. Dethatching is essential to maintain a healthy lawn. When thatch approaches or exceeds the threshold of 1/2-inch thick, it becomes necessary to remove this thatch. We use a state of the art flail type machine which gets the job done right. This should be done every second year. Your Lawn is the welcoming mat of your property. PJC will enhance your lawns beauty with professional treatments resulting from many years of experience. Organic weed management takes time, but is worth it. It will provide you with that quality lawn and peace of mind of doing it the natural way. Four applications every six weeks starting Late April to early May. Core Aeration of your lawn is a must at least once a year. This helps the grass roots penetrate deeper into the soil which in turn will spread easier. The result is a healthy lawn, more tolerant of heat, disease, and drought stress. It is important to overseed once every year to keep your lawn thick and hardy which in turn will crowd out broadleaf weeds such as dandelions and crabgrass that crop up in bare or thinly covered patches of your lawn. This can be done either in spring or fall and is important to use a professional grade of seed which is not available over the counter in the common retail market. We however import hundreds of pounds of the very best quality and variety of seed suited for our canadian climate. Top Soil And Seeding your lawn is a cost effective and easy way to renovate your lawn. Over years lawns can become weaker due to soil compaction, and thatch build-up. When a lawn is underperforming, and fertilizer, and water do not seem to help, It is time for a good soil and seed Job. We at PJC have developed a special system using certain techniques combined with the right products in applying this service. Have your hedges trimmed by our professionals while you sit back and relax. We use only state of the art equipment and techniques to get the job done right. Our hedge crews have over ten years experience. Have your trees trimmed or pruned the right way. We have a knowledgeable crew who have been trimming your small to medium varieties of trees for years. If you want your trees to grow right the following year, give us a call.